Artificial mangosteen is great to use anywhere and look realistic. Perfect for decorating your home, shop, kitchen, and artificial fruit display. Also, excellent for trade shows, fruit shops, film shoots, buffet displays, photo shoots, teaching tools, etc. 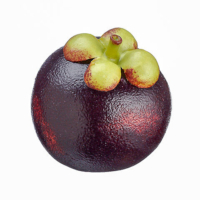 Great looking fake mangosteen for decorating anywhere you need to display fruit. Above all, Amazing Produce is going to be your one-stop choice to buy artificial mangosteen. Consequently, our fake mangosteen can be an excellent choice for your kids as an educational tool if you want to help your children learn with real looking fruit. Put some wonders in your decor collection with a fruit plate or fruit basket. Incredibly realistic fake mangosteen. In conclusion, this is a perfect display for your home decoration.